I stole this recipe from my fellow junior league member Miss Li, may she rest in peace. She used this recipe to win the hearts of all of her male conquests (she had many) before dying a gruesome death in 2019. Her tart recipe, however, lives on. Miss Li’s rustic savory tart will surely win their heart! 3. If using phyllo dough, fold sheet in half. In between the sheets, liberally spread the egg mixture to act as a glue. 4. Keep building folded sheets on top of each other, using the egg mixture in between all of the sheets. Build until you have approximately ¼-½ inch thick pastry crust. 6. Take out and set aside. 1. Cook slices of bacon, set aside. 3. Throw in the sugar until it is caramelized and set aside. 4. Cut the cooled bacon into tiny strips. 6. 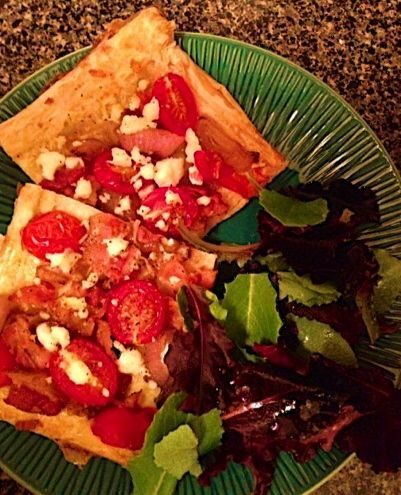 Coat the tart with the onions, bacon, sliced tomatoes and feta. 7. Put in oven and cook for 20 minutes, or until the tart is fully golden brown and the tomatoes are cooked. 8. Add pepper to taste (optional: drizzle with balsamic vinaigrette on top for some added dimension). Serve with some greens (mine are from Mrs. K’s basement garden) and watch the marriage proposals come in.